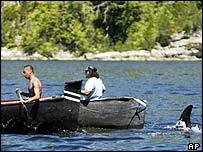 Attempts to rescue a lost whale in Canada are causing conflict between biologists and a small Indian tribe. The killer whale has been living by itself in the harbour of the small town of Gold River on the Pacific coast. Officials say the whale, nicknamed Luna, is a safety hazard and believe it should be returned to its family. But their efforts have been thwarted by members of a local aboriginal group who say the whale is the returned spirit of a former chief. The whale rubs up against both boats and the float planes that land in the harbour. Officials say that could easily prove fatal for both the whale and passengers. Scientists say Luna is probably just very lonely. They want to capture him, load him onto a large truck and drive him more than 300 km down the coast to where his family is currently swimming. That move was supposed to be under way now. But a local Indian tribe has so far stopped the effort. They tell the story of their chief who on his deathbed three years ago promised to return as a whale. Three days after he died Luna first appeared in their harbour and has not left. Citing that spiritual link the tribe has strongly opposed the move this week and has taken to the water in traditional canoes. They have managed to lure the whale more than 20 km from the pen in which scientists hope to catch him. Officials now say they will try to move Luna next week. Until then they have agreed to let the tribe spend a weekend praying with the whale. "It's becoming a tug of love"